Tonight, very sadly, sees to air the last-ever episode of The Cook and the Chef, the only television cooking show I have watched avidly since it began four years ago. I love the dagginess of it, the focus on the food and the recipes and the growers and food producers, rather than the celebrity of the presenters or the flash panache of the camera angles. I love the aunty-nephew banter between Maggie and Simon, their contrasting tastes and techniques and styles with food. I love the greedy earthiness of their dive-in-and-taste-it methodology at the end of each show, and the honest love of food evident in their gasps and groans while they cup their hands beneath their chins for drips and crumbs. (I have even grown fond of Maggie’s idiosyncratic terror of chilli!) I love the general air of generosity, egalitarianism and passion that has infused this program since the start. The sense of bounteousness isn’t just about the food itself, either. Both of them speak magnanimously of other chefs, cooks, providores and producers, but Maggie Beer in particular is renowned for her generosity in promoting people and places she thinks have something to offer. I know of a particular story demonstrating this, when Maggie went to Shanghai to cook at M on the Bund, where our beloved bro-in-law Hamish (who is sadly mostly excluded from joining us here in howtoshuckland these days by China’s Great Firewall!) is executive chef. I am told that when she got up to speak after the Maggie Beer M On the Bund luncheon, almost the entirety of her address was taken up with singing the praises of Hamish and his staff rather than discussing her own role in the luch – and she has kept up the praise ever since. And then I had my own brush with this munificence, when Maggie wrote to Hamish and Kate telling them how much she liked my book The Submerged Cathedral, which they’d given her to read on the plane home. You can imagine my breathless excitement at that news when they passed it on, knowing I was such a fan of her books and the show. Then the next day, I suddenly began getting texts from friends saying Maggie Beer was on ABC radio recommending my book. Asked in an interview about what she did in her spare time, she apparently began rhapsodising about reading, and mine happened to be her favourite book of the moment. So it’s very clear to me that Ms B is the type of person who will not let a chance go by to give a push to other creators she thinks might do with a helping hand. I reckon there are two types of creative people – the ones who are fearful of losing the edge, protecting their patch, hoarding ideas, always competing and anxiously looking around at who might be getting ahead of them. And then there’s the other kind, who see their creativity as an ever-filling well, who know that no matter how much they give away, there will be more than enough to go around, and who genuinely get a kick out of sharing their knowledge, skills, and success. And that is the spirit that has so enlivened The Cook and The Chef for all these years. So tonight I will be sitting back with a glass of wine, watching and toasting Maggie & Simon for all the fun they’ve brought into our house. Hurrah for them. How lovely! 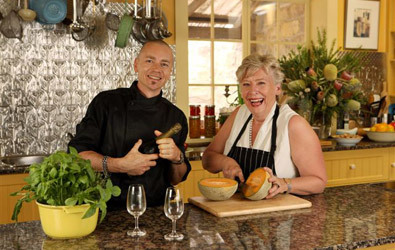 Not owning a TV, I’ve never seen this program, but I’ve eaten plenty of Maggie Beer treats over the years, and now I’ll do so with even more relish knowing she’s such a bloody good sport. A couple of years ago a friend gave me a Maggie Beer demonstration class she couldn’t go to, and MB was truly adorable – it was a little bit haphazard, very relaxed, some things were forgotten, or improvised, everything ended up tasting fabulous, and along the way she gave lots of plugs to local producers, and was so generous in sharing her knowledge and herself. Here’s to the ever-filling well! Bugger! I was more of an occasional viewer but always enjoyed it whenever I caught it for all the reasons you mentioned. I do like a good dose of friendly. egalitarian dagginess on TV. Not enough of it. Oh well, it’s almost a certainty that they’ll repeat it, and I’ll make a point of watching/taping it next time round. Oh, I saw a quick dash of it. I wish I’d hung around and toasted them too. Lovely post, Charlotte. As a long-time(and I mean long)and old friend of Maggie living now in Vienna, Austria, I’m proud to be able to post a comment on her progress and success in the Aussie Foodie World! Friends from Oz have brought me videos of the show so I could see how it was. I have many of Maggie’s books, which I’ve perused over the years and marvelled at. She is everything that so many commentators have written–truly generous, creative, honest and forthright, of course–but above all a very special person whom I’m sure will be sorely missed, along with Simon, on your TV screens. I am proud to read about her and to be able to keep in touch with her, albeit from Europe, but you are truly an Aussie treasure, Maggie! Obviously I meant “hear, hear!”. My, one shouldn’t comment after drinking a double G & T really.